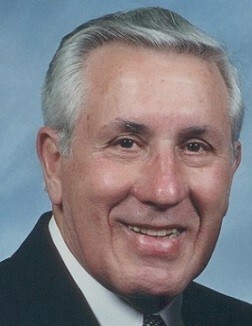 Alexander “Al” Thomas, formerly of Pleasant Hills Borough in Pittsburgh, Pennsylvania, passed away peacefully with his family by his side on Thursday, April 11, 2019 at Providence Point, a retirement community in Mt. Lebanon, Pennsylvania. Al was born in 1925 one of two children of Alessandro and Anna Marie (Godderz) Thomas in Brownsville, Pennsylvania. Upon graduating from Monongahela High School in Monongahela, Pennsylvania in 1943, Al joined the U.S. Army Air Forces, serving as a flight engineer during World War II. After the war, Al attended the University of Pittsburgh, graduating in 1951 with a B.S. in Electrical Engineering. Al went on to have a 30+ year career in the AT&T Bell System. In 1985, Al joined Health Center Communicorp, Inc. as President, leading the installation of one of the nation’s first hospital fiber optics systems. Outside of work, Al dedicated his time to fundraising for the University of Pittsburgh, lecturing at his church, coaching sports teams, participating in the Knights of Columbus, golfing, and socializing with friends and family. In addition to his parents, Al was preceded in death by his wife of sixty-six years, Yolanda “Lundy” (Sidone) Thomas, and his sister, Anna Marie “Annie” (Pete) Cepaitis. He is survived by his three children, Donna (Ric) Herald of Leesburg, Virginia, Linda (Jon) Bartlett of Chatham, New Jersey and Michael (Karen) Thomas of Kennilworth, Illinois and his five grandchildren, Michael Herald, Krista (Drew) Balzer, Jack Bartlett, Anne Marie Thomas and Michael Thomas. Friends will be received in the STEPHEN D. SLATER FUNERAL HOME, 1701 Route 51 (Large) Jefferson Hills, Pennsylvania 15025 (412-384-0350) on Friday, April 12, 2019 from 4 – 8 p.m. There will be a prayer in the funeral home on Saturday, April 13, 2019 at 10:45 a.m. with a Mass of Christian Burial at 11 a.m. in St. Thomas A’Becket Roman Catholic Church, 139 Gill Hall Road Jefferson Hills, Pennsylvania 15025. His burial will follow in Jefferson Memorial Park Cemetery in Pleasant Hills. In lieu of flowers, donations may be made to Three Rivers Hospice, 2500 Mosside Boulevard, Monroeville, Pennsylvania 15146, Attn. Robin Smith.